Each segment or level focuses on one main functional subject. There are foundational underlying themes that reoccur and continue evolving in each of the segments. Every segment builds on the previous ones so the learning grows exponentially and integrates into one field. The hands-on practice and group movement lessons introduced in each segment relate to the focus of the segment and build, over time, in their complexity and level of physical and cognitive skillfulness and refinement. As you move through these segments, you will gain knowledge of how the nervous system functions to organize action and how specific core ideas in the method can be applied to a multitude of situations and conditions. By the end of each segment, you will have mastered an area of knowledge and practice in your own life and for future professional use. The ABM NeuroMovement® Practitioner Training Program offers a unique opportunity to learn powerful ways to take advantage of the remarkable ability of the human brain to change itself for the better. Through an experiential and intellectual process, you will find yourself transforming your own pain and limitations into strength, flexibility, vitality, and creativity while gaining powerful tools to help others do the same. You will immerse yourself in a process where you’ll repeatedly experience the impossible becoming possible, reaching new levels of freedom and refinement in your own movement, feeling, thinking and awareness. Your transformation and personal evolution are at the heart of the profound understanding and skills you will acquire to effectively and powerfully utilize when teaching others. Each trainee in the program is personally supervised while in the process of developing the skills needed to facilitate transformational changes in others. 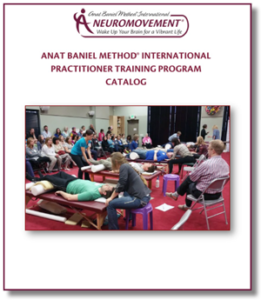 Using practical and theoretical learning, as well as a mix of in-person and online learning, Anat Baniel and her outstanding faculty provide the path for trainees to become successful ABM NeuroMovement® Practitioners. Each trainee is challenged to learn and transcend limitations in a supportive and empowering environment. 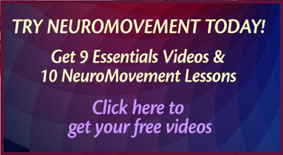 Transformational Movement LessonsSM (TML): These group movement lessons, which can also be taught individually, are designed to re-awaken the brain to create new connections and patterns that lead to breakthrough positive changes. They are taught in a functional progression so that they are performed with ease and are safe to do. Each movement lesson has a central theme, along with a number of variations that are designed to provide the brain with new information. Functional SynthesisSM (FS): These are one-on-one movement-based lessons that are taught individually and are customized to a client’s particular needs. Trainees will learn to use gentle movements to communicate with the client’s brain providing it with the information it needs to discover new and more efficient patterns of movement, feeling, and thought. These lessons will help to eliminate pain, transcend limitations, and reach higher levels of performance. Sessions are conducted with the client fully clothed, sitting, standing, or lying on a specially designed table. Group Learning: The training is structured to promote building close relationships between the teaching faculty and participants, and also among the participants themselves. Most of the learning is done in a group context. The variations among the trainees, each with their unique strengths and life experiences, contribute to the richness of the learning experience. Trainees have the opportunity to build strong bonds and gain friendships and collegial relationships that last well past the training. Trainee Private Sessions: During the Practitioner Training Program, each trainee receives individual Functional Synthesis (FS) lessons from the training staff while attending the In-Person segments. Practicums/Supervision: During the Practitioner Training Program, each trainee teaches a group of movement lessons (TMLs) twice to their peers, under supervision. During this program, each trainee also gives a supervised, one-on-one session (FS) to two people that are not part of the training program. Immediate Use and Application: Trainees are encouraged to begin practicing what they learn early on and are provided with teaching materials after each segment. This approach is similar to the process of learning a language; Anat and her teaching staff help trainees gain access to this new language in a seemingly effortless way. Teaching Materials: After each segment, trainees are provided with written transcripts of the Transformational Movement Lessons and written summaries of the Functional Synthesis teaching to support further learning, for continued assimilation of information, and for future use in their practice. In addition, articles, reading suggestions, and other materials are provided to help the learning process continue between sessions. Anat Baniel’s two books Move Into Life: NeuroMovement® for Lifelong Vitality and Kids Beyond Limits are required reading. Access to the Training Coordinator and Teaching Staff/Office Hours: Trainees have access to the training coordinator and teaching staff during and in between training segments. Trainees can discuss questions and/or concerns regarding personal or professional training matters. During training segments, there are no formal office hours. However, trainees can schedule a time with a teacher during breaks or before or after class hours to discuss any issues. Additional Guidance/Tutoring: One-on-one tutoring over and above what is offered during training hours is not encouraged. However, if tutoring is deemed necessary by the teaching staff, it is available for a fee. Additional FS Lessons: Trainees may schedule additional one-on-one FS lessons with any of the teaching staff, depending on the time and availability of the staff.